A project manager or artwork coordinator either prints out artworks or distributes them as email attachments to multiple departments for review. Approvers mark their comments on their own copy of the artwork and the coordinator collates the comments and shares them with the designer. Constant follow-ups and phone calls are required to get status information and only the coordinator knows what’s going on and where the artwork is pending. The process is ad-hoc and may not follow the same routing every time. How will implementing ManageArtworks help you? With an online structured workflow, everyone knows what’s happening. Artworks are centralized and people review it online without having to make copies or attach them with emails. The Artwork Coordinator can see the status of the workflow online and so can everyone. The system sends alerts and reminders and does the follow-ups, freeing the artwork coordinator be more productive. Move from a people dependent scenario to a process dependent scenario. Metrics are automatically collated and its easy to see where things are going right or wrong so that corrective actions can be taken. New people joining the organization can be quickly inducted into the process and require less training. Move to Stage 2, 3 & 4 to reap more benefits over the years. There is a shared drive or a document management system in which artworks and other files are saved. There is a defined process through which artworks are sent for approval and there is a basic workflow that is followed. With the addition of online proofing tools, users reduce the number of hours spent on manual proof reading of the artwork. Proof reading tools enable errors to be identified faster and sooner leading to reduction in number of reworks and faster approval cycles. Improved efficiency leads to increase in overall quality and compliance. 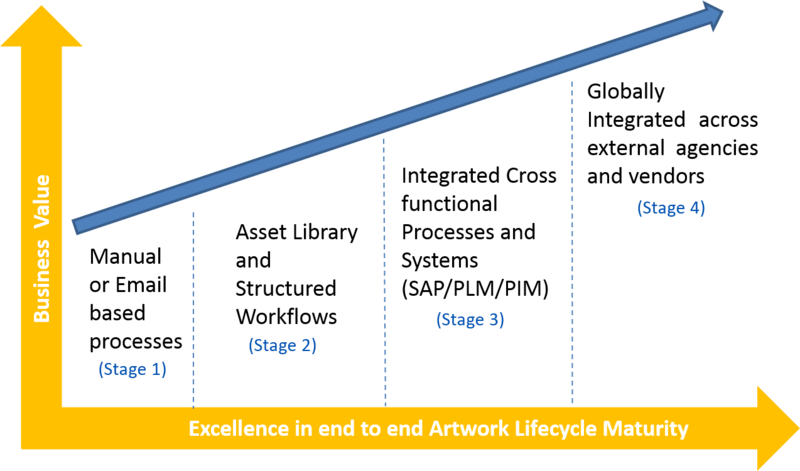 Cost of quality reduces with significant increase in volume of artworks processed. Ability to respond faster to market demands without compromising on quality and compliance. Increased speed to market results in increased revenue from product launches. Get Stage 3 & 4 benefits by integrating with SAP and other systems. SAP or other ERP system is in place. A central repository and artwork process is also in place. At different stages in the workflow where SAP codes need to be created or accessed, the tasks are done separately in SAP and re-typed into the artwork system. Item codes related to BOM are manually entered into the artwork system. Integration with SAP allows seamless data exchange with item codes created in SAP at the appropriate step in the artwork process. Product information (SKU details, Item codes, etc.) are synced automatically between SAP and ManageArtworks to avoid any errors. Packaging BOM collation at ManageArtworks can be pushed into SAP automatically after approval. Printed material inventory can be checked directly in SAP when initiating a change request for an artwork to decide if the change should be effective now or after the existing inventory is exhausted. Integrating with SAP allows expanding your business processes from a simple standalone Artwork System to encompass Packaging BOM process, New Product Development process and New Packaging Development processes. Save money by significantly reducing the number of packaging material write-offs due to wrongly printed artworks or old stock lying around. Integrate with QMS systems for initiating artwork change requests processes, integrate with Document Management System (DMS) and Digital Asset Management Systems (DAM) to push the final approved artwork for broader access. With a process, repository and SAP integration in place all internal stakeholders are able to approve and release artworks. There is a coordinator in the marketing department who interacts outside the system with design agencies, a coordinator in the supply chain or procurement team who works with print vendors, a person who coordinates all interactions and obtains artwork approvals from the customer and a coordinator who works with contract manufacturers and OEMs. Different markets work with different external entities in their own way. Get all stakeholders internal and external on the same system and interact with them in a simple and secure way. Interact with everyone within the system and get the benefit of speed, security and efficiency. Customers simply receive an email with a link to view the artwork and approve. Print vendors get a link to download the files required for print. No messy user management overhead of creating logins for each and every print vendor or customer. Simple use their email address to include them in the process. As your business grows to other markets and more partners come on board, the same system can expand to accommodate them. With so much data being collected in the system, comparison of quality, cost and time can be made across vendors. Adapting to newer business models becomes easy and impact of M&A on artwork process is manageable.